Do you wish to bring back the good look of your window surfaces fast and efficiently?Are you scanning for an approach of effective window washing? If the answer is positive, you have come to the right place! With the specialists of window cleaning in Enfield, you will successfully bring back the light into your property. You will enjoy impeccable glass surfaces as well as completely clean framework and sills. You will be able to use your newly-acquired spare time as you desire while we shine the glass surfaces of your home. You will not only avoid this tedious and demanding work – our services will also present you some delightful advantages. We also provide our professional services in nearby areas: Capel Manor, Forty Hill, Enfield Wash, Winchmore Hill, Ponders End. We provide residential and business window cleaning by using sophisticated methods. You can rely on our professionalism for all types of glass surfaces, skylights and conservatories. For windows placed up to your fourth floor, we use water-fed extension poles. This system is comfortable and allows risk-free cleaning systems – the poles are connected to the water reservoir in the van. For higher window surfaces, our rope access team will grant you speedy and efficient end results. You can gain a lot from these techniques right now – just call 020 3746 3113 and place an order! The experts have the experience and the needed equipment to provide you with both domestic and commercial window cleaning. You can rely on us for every type of glass surface cleaning. For instance, we can clean small or double windows, sash ones, French doors, bay windows and patio doors. Furthermore, if you have garden glass surfaces, greenhouse or skylights, we can clean them too. We use the latest methods and the latest equipment for all the aforementioned types of windows. You can be sure that the gleaming look of your commercial building is granted. The professionals will will fulfil your need of superb commercial window cleaning. With our water-fed extension pole tools, you will get swift and excellent washing of all windows up to the fourth floor. For taller buildings, we put to use our rope access gears. It is our efficient technique of reaching glass panes on taller structures. Regardless of what is the size of your business premise – a humble corner shop or reinforced-concrete giant of London – we will guarantee pristine look of your windows. 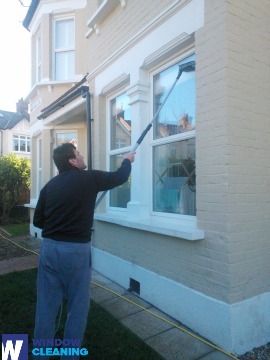 Benefit with our swift and reliable domestic window cleaning in Enfield. We can clean the windows of your property in and outside. The detergents we use are environmentally friendly - you will love the perfect results and be ecologically responsible. Furthermore, we use only purified water. Don't wait, dial 020 3746 3113 and order our first-rate services. Our customer representatives will assist you – they are on-call 24/7. We have other ways of booking – our request-a-service online form or just chat with our operators.